Here we are again, back in the far corner of an RV park. Unless we’re staying in a remote area without campsites we always seem to get assigned one ‘way over in the corner, on the edge of the park, far from traffic and, hopefully, out of sight. But a hippie bus is hard to miss wherever it’s parked. Nat and I don’t really mind, of course. Privacy is the most coveted thing in any RV park these days, even though the cost of fuel is climbing and the value of savings is tumbling. Parks are often crowded. We dutifully dragged ourselves to our respective jobs everyday for over forty years and we saved up our money so we could live like gypsies someday. So, now we do, and so do lots of other people. Nat color-coded the blocks that stabilize and elevate the bus tires when we park it. I told him that was nerdy, he says it’s artistic and practical. Which is true, which is typically Nat. Nat is Nathan James Creekwater, master pipefitter, welder, union organizer, artist and lover. My lover. No, we’re not legally married. We both used to be married to other people and we learned some things about marriage that we never wanted to know. So we spoke our own promises to each other which didn’t require a license from any state, or a three-day waiting period. (Our marriage did not start out like buying a gun.) It works for us. And, it apparently works for a lot other people who are living like gypsies these days. You meet a lot of live-ins in RV parks. We’ve leveled this bus in the dark, in the rain, in the desert and on the plain. But not in Spain. We prefer the United States of America, and Nat prefers the South. They made him take down his Confederate flag when he hung it over his bunk in basic training. So he took it down and immediately replaced it with a Mississippi state flag. Surely they couldn’t tell a young army recruit, fresh off the farm, that he couldn’t hang his home-state flag? Well, they didn’t, despite the fact that it is simply a Confederate flag with the addition of a one red, one white and one blue stripe. We got out the food and slid onto thickly upholstered benches on either side of a small oak table that Nat custom-built to fit in a small space and fasten to the pickled cedar paneling. But the patchwork upholstery on the benches is all my own handiwork. Every crazy fabric patch reminds me of different times and places and people I’ve known. My name is Catlyn and I’m a fabricoholic. I’m also an herbalist and medical researcher, and I conduct consultations online. It’s astonishing what you can accomplish on a laptop in a hippie bus these days. “Got butter?” Nat asked as he dipped stew into his hand-thrown pottery bowls, the deep green pair that always reminds me of malachite, and dining like royalty. Four narrow strips of oak trim, delicately carved with acorns and oak leaves, form railings across narrow shelves on the wall over the table, keeping sundry items from falling when the bus is in motion: salt, pepper, napkins, candles in tins with lids, crackers, notepads and pens, matches, etc. As you know, Nat is a Southerner. I always thought all Southerners ate greens, such as turnip greens, collards, and mustard greens. Not Nat. Green pepper, yes, leafy greens, no. After a few peaceful minutes of eating and studying a map of the lake the interruptions began, the inevitable knocking and interviewing by RV park security, often followed by more knocking and more interviewing by local law enforcement. We’ve come to expect it. A hippie bus is often inhabited by hippies, and hippies often use drugs. We’re used to it by now. I think Nat actually enjoys these authoritative visits to some extent. Tonight he didn’t mind because he doesn’t like green stuff and he knows I’ll offer them our food. Nat grabbed it from the plastic envelope on the refrigerator door, kept handy for just such a visitor, and handed it to the 6’2”, farmer-tanned, 40-ish Texan. His muddy Super Duty was still running with his wife and kids inside. That’s a good thing because it means he doesn’t plan to stay long. “Well, I showed it at the office when we registered, but, sure, you can check it again. It hasn’t changed much.” Nat has a special grin he saves for authorities. His smile starts at the left corner of his mouth and gently spreads across to the right until teeth appear and it doesn’t stop growing until just before laughter escapes because it’s not good to laugh at a time like this. Nat wiped his face with a napkin, leaned over the table towards me, grabbed my hands, looked straight into my eyes and said, “Yeah, that woman could plainly see that you’re a real problem, Cat. They have rules about pets everywhere you go these days. And you surely are one, you’re my Pet Yankee and that’s just plain obvious. But you’re a pretty good one, as Yankees go, all your green stuff aside.” Then he picked up his glass and sucked that ice tea straight down, sounding like the final seconds of a bathtub draining. It’s been seven years and I still treasure the idea of being his Pet Yankee. Nat always loves his pets deeply. He’s owned hundreds of dogs, several cats, hamsters and white rats, but he’s only had one Pet Yankee so far. When we met he said he liked my northern twang. I tried to explain that he’s the one with the twang, not me. I pointed out that TV commercials sound like I talk, not like he talks, but my explanation didn’t cut it. I won’t go into detail about the rest of our evening, but the supper dishes got left ‘til morning. Nat’s cell phone rang before the sun woke us up next morning, another union call. Thirty years of industrial steam pipe fitting and welding and dealing with the labor union turned into another career when Nat became a union negotiator himself. He’s still involved as a consultant. Times have changed and the welfare of individual members is blurred by the demands of union organizers themselves. It’s a mess of self-interest and greed, pretty much like government at all levels today. Usually Nat goes up to the driver’s seat in the front of the bus and stares outside while he’s sorting out the details of complex phone conversations. But today he chose not to get out of bed. So I slipped out first, pulled on a big white T-shirt and got the coffee pot going for us. Nat is actually the best coffee maker, and he’s the cook today, too. It’s hard to keep that man out of the kitchen. Growing up, he had a lot of kitchen duties, being second oldest in a big farm family with no indoor plumbing and lots of dishes and laundry requiring hauling water. And there was always wood to cut and haul and stack for heating that water, too. Mornings started before daylight with cows to milk and a school bus to catch for the forty-five mile bus ride to school. No wonder he loves his funky school bus conversion. A school bus was Nat’s home-away-from-home when he was growing up. Now he’s got his very own bus with its very own name painted on the side in Japanese. It reads: Chuutetsu Chouchou, in English letters, spelling out the sound of the Japanese words meaning Iron Butterfly. We sat together and listened to birds chirping in the woods, trying to identify them by their individual calls like we always do, and slid open a window over the sink to get the full effect, which included distant highway traffic gearing down the hill toward the mile-long Willis Bridge across the lake. “Where’s that Texoma map?” I said, reaching over the table to the railing catch-all. But just then we looked at each other and began the all-too-familiar drill, slipping off the bench and zipping into our blue jeans hurriedly because amidst the various bird calls we began to hear voices approaching the bus. There’s never a dull moment in the Iron Butterfly, and that’s why we love it. “Girls or guys?” Nat inquired as I peered through the security peep hole installed through the wall by the front door. I waited for the knocking to begin. You can tell a lot about a person by how they knock. Timid, assertive, drunk… it’s all in the knocking. Usually visitors catch Nat outdoors working, so he gets more than his fair share of visitors wanting photos and guided tours. As he said, this one is mine. “Sure”, I answered while reaching into a deep cubby hole beside the door and extracting a well-worn guestbook. “Would you mind signing our guestbook with your name and city so we can share it with our own grandkids?” They all smiled and agreed as I stepped down and passed the book around for signatures. One of the men began to ask questions about the bus and I flipped to the back of the book where several laminated pages of photos and drawings show the 1969 Type C Blue Bird bus in its original condition, and in the process of converting the interior and painting the exterior. First they all took turns with the guestbook then Florence, the knocker (as Nat calls them), led me over to her favorite part of the paintings. I have a pose for each different landscape and she chose woodland wildflowers so of course I struck a flower fairy pose. Nobody ever expects me to pose, which makes me the best part of the show. After considerably more small talk they all piled back into their newish Lincoln Town Car and backed out of the lot, smiling and waving like family. And that’s how it goes almost every day in good weather. Rainy days we get a break. We also have a door-hanger, a printed sign that works wonders. It says, “Come back tomorrow and we’ll show you all our travel photos.” I was so relieved when I found that one because it replaced Nat’s personal favorite which is “Don’t come a’knockin when the bus is a’rockin”, a lovely sentiment that, unfortunately, caused too many lewd comments for too many years. Now I keep it hidden in a drawer and bring it out only for special occasions, mostly involving family. “So, would you give me a flower fairy pose now, too, c’mon, would ‘ya?” Nat said as he feigned a poor imitation, bent slightly forward, hands on his knees, head turned, looking over his shoulder. About the truck, it’s a 1984 Toyota, a two-wheel drive model since it’s a tow vehicle. Nat rebuilt it especially to use with the bus, so we can haul his welding supplies as well as household items. It’s great on gas and very reliable out in the boonies where we like to go. We could have sold it a hundred times for thousands of dollars, but we won’t ever sell it now. It’s part of the family. I took a quick shower and got dressed for the scouting expedition. Since I’ll have all of Lake Texoma to myself for a few days I want to get my bearings in the area while there are still two of us in the truck, one driver and one navigator. Locking up the Iron Butterfly from the outside requires a little more finesse than simply closing your average residential exterior door. Picture one of those hinged glass doors on an old school bus with an iron security bar and a big padlock. First you have to drop the bar into position, and then you have to fasten the padlock through the bar and make sure it’s securely locked. (Sometimes I forget to do that.) Many people replace old hinged doors with regular RV doors when they convert school busses, but we prefer the authenticity even though it’s cumbersome. “Did you see a diner around here when we pulled into the park yesterday?” Nat asked hopefully. It wasn’t hard to find because the parking lot was full of trucks. That’s a good sign. Smokers congregated over on the north side of one big room, so we chose a table on the south side. Debbie was plenty busy but she took our order right away and we settled in to listen to the locals talk. And oh boy, did we get an earful, mostly about ourselves. The Iron Butterfly wasn’t mentioned by name but there was much speculation about several reports of hippie bus sightings at the RV park down by the bridge. To which he replied, “I gotta do it. I can’t leave you alone here with this kind of talk going on.” Then he pushed his chair back, stood up and slowly walked over to the table of geezers gathered for gossip. Those tables are everywhere, and Nat has talked to many a table-full over the years. Silence greeted Nat at the gossip table as he reached over and grabbed a vacant chair to join them. He’s learned not to ask permission to join, it’s too risky. Instead, he turns a chair around backward and sits facing the group over the back of his chair, an impromptu podium. And then he smiles and doesn’t say a word until somebody else talks. “Howdy. You new here?” asked a white-haired rancher-type gentleman, probably in his mid 60s. By now the whole place was chewing slowly and watching the show. Debbie was standing at the cash register, wiping her hands on her apron and trying not to stare, while her cook was unusually quiet working in the kitchen. I was unruffled and deliberate, slowly drinking my coffee. You could actually hear a vintage Lonestar Beer clock ticking on the wall. Smiles and laughter broke out and many of the usual questions and answers followed. The whole room took a collective breath as normal diner chatter and clatter resumed. In a couple minutes Nat waved me over to their table and I stood up just as our steaming food arrived, so Debbie served us at the gossip table and we ate with the guys. Looks like we’ve arrived. The Iron Butterfly is licensed in Oklahoma, the state we call home. Nat’s parents retired to a wooded acreage outside Tahlequah in the 1970s where his oldest son has been living since Granny and Grandpa died. We finished out a loft in the old barn and we park the Iron Butterfly down below, so we call it “the Okie duplex.” Oklahoma tags are better than Yankee tags when you spend a lot of time driving through the South in a hippie bus. Nat invited Richard (their undisputed spokesman) and his group over for a tour after breakfast. Judging by their conversation I suspect this bus tour will involve more engine parts than interior décor. So I made a suggestion, “Nat, why don’t you ride home with somebody who’s headed our way and I’ll take our truck to get groceries.” Nobody argued with that plan, so I finished my coffee and shook everybody’s hand on my way to the door. “Really nice to meet you Mrs. Creekwater. Appreciate you lettin’ us roam around your place ‘n all.” That was Buddy, in his Vietnam Vet Pride cap, who drives an old Power Wagon and likes gardening. Nat mentioned that I’m involved in plant medicine and Buddy was fascinated though he said he'd never thought much about plants as medicine. He asked about reading my book, so I explained that what I write is not really a book that you sit and read because you want to, but more like piles of papers that doctors read because they have to! That didn’t intimidate Buddy, though. As I was pulling out of the lot I noticed Richard and Buddy negotiating for the privilege of driving Nat back to the bus. They actually got out a quarter and flipped it. Buddy won. I found myself thinking about my little bump-out greenhouse that Nat installed, replacing one of the original sliding bus windows. Wherever we go the Iron Butterfly attracts attention, but my little window greenhouse, positioned above the dining table on the interior and above painted native prairie grass on the exterior causes the most comment. It was my fifth anniversary present and to this day it’s my favorite present ever. I followed Buddy’s Power Wagon, Richard’s Silverado and two other pickups going north on Texas Highway 377 towards the Willis Bridge. But I pulled into the parking lot of Hilltop Gas & Grocery while the motorcade continued down the hill on its tour of the Iron Butterfly. Posters advertising local businesses covered one window surrounding a “You Are Here” map, so I took time to look for a place to get our haircuts. Found one right around the corner, so I hopped back in the truck to check it out before shopping, a good decision considering it was several hours before I made it back to the bus with eggs and milk. A thick hedge of yucca spikes reaching over six feet high greet visitors to Tater Hill Hotel today. I found a parking space in the crowded lot, switched off the truck engine and just sat there absorbing the scene. Juniper trees in all stages of growth and thick, old post oaks shaded the rustic two-story building wooden building with a massive covered porch wrapped around the front and lake side of the second story, bringing back memories of the Long Branch Saloon, with Matt Dillon wooing Miss Kitty decked out in the sassy saloon finery required to manage her wild-west empire. It looks as though three-quarter and one-ton trucks are the rule not the exception on Tater Hill. Some folks are having brunch in the Triple Threat Café and some are seated outside on benches and rockers because the all the seats inside are full of patrons waiting for haircuts at the You Are Hair salon. This shop window is also filled with familiar local business posters framing iridescent green and gold retro-lettering proclaiming You Are Hair! Well, by golly, I guess I am! Just then, a middle-aged blonde stuck her head out the door and spoke to a teenage boy on the bench. “Freddie, your grandma says you’re next, no matter what. She brought you and she’s almost done so get in here now!” And that, as anyone on the West End of Lake Texoma can tell you, is Janina Stephina Madelina Lourdes Lewiston, locally known as Jaylew. And this is her place, I mean the whole thing, the hotel, the café, the salon and the saloon which was not immediately apparent (on purpose) since it’s open only by invitation on Friday and Saturday nights. Grayson County, Texas is a dry county so the only way to serve drinks legally is to sell memberships. In the late 1980s when she built the place Jaylew limited her sale of saloon memberships to 1000, which sold out in one weekend and have passed from one owner to the next at collectors’ prices. There have been countless memberships advertised and auctioned to the highest bidder, and more than one Dallas resident has passed a Triple Threat membership by will. When I pushed open the antique door leading into the hair salon a complex aroma of perm fixative, fingernail adhesive, massage aromatherapy and juniper incense filled the sunny entryway which contained four upholstered chairs. “Busy today, aren’t you?” I asked a lovely young girl with waist-length auburn hair, just the way cowboys like it I hear. All seven operators’ chairs were occupied and Jaylew looked as though she was just finishing up with Freddie and his grandma. She had two chairs going which, it turns out, is her usual practice. The receptionist walked over to Jaylew, asked her a question and returned with a smile. “Well, I’ll be… " Jaylew stepped back up to the chair and as we looked at each other in the huge mirror I knew it was my turn to talk. “Well, that’s flattering,” I said, just to see what would happen. Jaylew didn’t miss a beat, “What? Flattering? So you’re Little Miss Hippie Bus? Here, let me get a good look at a real hippie.” And she swung the chair around so we faced each other, laughing. When they heard our conversation all the other operators and patrons started asking questions and remarking and laughing and some wandered over, draped and foiled, to introduce themselves. Jaylew isn’t shy. In fact, she’s pretty much the opposite. She snipped and talked and I listened and collected plenty of local lore on Lake Texoma as well as her hotel, café, salon and saloon. She’s definitely a Miss Kitty of the twenty-first century, and she’s recognized all over north Texas, thanks to the famous TV ads. Jaylew is married to Mark Lewiston, the man and the car dealerships. Everybody with a TV set in north Texas has watched Jaylew and her triplets climb in an out of Mark Lewiston Motors’ cars, trucks, SUVs and even pontoon boats since the kids were babies. Now the triplets, two girls and a boy, are turning 27, Jaylew is 47 and Mark is 50. In his spare time, Mark is a fishing guide on Lake Texoma, an avid bow-hunter in Whitetail season and an international long-range high-powered pistol champion. Mark Jr. helps run the car dealerships, Maggie is the beauty operator two chairs down from Jaylew who also manages the Triple Threat Café, and Madelina is in law school in Dallas. The life of the Lewistons is never dull. “Guess I gave you an ear-full about myself, didn’t I?” Jaylew asked while handing me a hand mirror to check out the layering in back. “So when do I get to meet your interesting husband?” Jaylew teased me as she reached for her broom again. Toby’s face began to glow as she talked about how much she’s always enjoyed walking in the woods and fields and using a little old handbook trying to identify native plants and discover their history of use. I’ve seen that glow many, many times over the years. Planties I call them, people who have an affinity for plants that they don’t really understand, and other people certainly don’t understand unless they, too, are Planties. It was a relief to slide into the truck by myself and drive down the hill towards the bridge. Sometimes I just get peopled-out and need some time to myself. I passed right by the sign for Juniper Point West because the lake looked so fresh and windy, filled with neat little white-capped waves lapping against the red sand banks and the deep green tree-lined shore of Oklahoma in the distance. I couldn’t help myself, I just had to go there. Lake Texoma is known for its large population of Striped Bass and people come from all over the country to catch some in this uniquely saline water, meaning mineral salts, not salt water like an ocean. I could see several fishing boats out on the water and one or two sailboats off in the distance to the east. Nat and I have crossed the Red River many times in our travels, but this is the first time we’ve come this route, Highway 377/99. But I’m pretty sure it won’t be the last time. First thing I see when I get across the bridge is a sign for the University of Oklahoma Biological Station. Oh, that sounds ‘way too good to me and I’ve got ‘way too much to get done today to take that road, but I won’t be forgetting about it. They might have books or, better yet, Planties who can tell me about plants native to this area so I can collect some to study. Sounds like a good adventure for me while Nat’s gone this week. A little sigh, not deep or long enough to be labeled a groan, escaped out of Nat before I said, laughing, “Bye, see you soon,” and hung up. We have an arrangement. Living in very tight quarters we’ve found that preparing food while keeping up a conversation with new acquaintances is not fun. So, we take turns. Nat is already conversing today so I’ll fix food. That’s how the arrangement works. But tonight Nat will be doing the cooking if we have to put one of our signs on the door to discourage more visitors! Driving back to Texas across the Willis Bridge I remembered to turn right into Juniper West to locate the trailhead of Cross Timbers hiking trail. I passed a boat ramp and a camping area and eventually came to an old, worn map of the trail carved and colored onto plywood, giving me a picture of yet another adventure for yet another day. The pumps at Hilltop Gas and Grocery were full of campers and boaters gassing up, and it’s only the beginning of April, not yet high season for the glorified convenience store with a grill and several grocery aisles. I got the bread and milk and eggs we needed, and looked around for a few minutes before returning home to see a full-blown auto repair session going on beside the bus, tools littering the picnic table as well as the ground around the Power Wagon. “So, having some engine problems, Buddy?” I said as he stepped over to the Toyota and offered to carry my bag of groceries. “I can’t even say it once. OK, I’ll be back in time for a haircut if we leave now. Bye.” Nat kissed me quickly on the cheek before taking off in our truck with Buddy. Chop green pepper and grate yellow squash and carrots into a big bowl. A salad shooter or a manual grater both work well for this. Or try putting 1” -2” chunks of veggies in a blender about half full of water and pulsing a few times and then draining (save that water for soup). You’ll get small bits that work well in this recipe. Beat eggs, oil and buttermilk in a separate bowl and add to veggies in the big bowl. Blend in cornmeal mix. Pour into an oiled baking pan and sprinkle a little seasoning salt on top, mostly for color. Bake at 400˚ for 45 minutes to an hour, until the top is browned and it smells delicious! Sometimes I bake it in a stainless steel bowl in my crock-pot. It’s so easy, you just pour the batter into a stainless steel bowl that slips into the crock-pot and turn it on High for 3 - 4 hours. This works especially well in the summer when you don’t want to heat up your big oven. I call my crock-pot my “little oven” because it’s perfect for baking nearly all veggies, too! Before unloading groceries I switched on my laptop to get internet radio since it’s usually better quality than we can get with a tuner in the bus. I like to get the local flavor of small-town AM stations and as much local music as possible. North Texas has its own unique hard country music that I like in small doses. Nat prefers classic rock and usually has it going when he’s working on vehicles or welding, so I crank up what I like when I’m alone. So I did it. I got good grades and high exam scores. And I only took one semester off when Mom and Dad were killed instantly in a car accident one rainy night when a semi crossed the median on Interstate 35 and hit their delivery van broadside. I was a couple hours away studying for finals in my senior year of college. Fortunately, I knew how to run their store and after a few weeks and a few meetings with lawyers and accountants I finally accepted that I was running my own store. It was hard. And then I started med school and it was even harder. By now my pile of shredded carrots, zuchinni, cabbage, radishes, garlic and green peppers filled a big mixing bowl. I took a pint jar and shook up my own salad dressing of apple cider vinegar, olive oil and seasoning salt and poured it over the whole bowl of shredded veggies. Since nobody was around and Nat’s not too fond of leftover salad, I just plopped down on the patchwork bench, grabbed a fork and a napkin and hesitated a moment in prayer. I thanked God for my food and I thanked Mom and Dad for my education. She shot me a knowing smile and said, “That’s the way to do it, Dearie, that’s the best way fer sure.” We both laughed and I sat down at the table with the bag of herbal tea after putting the kettle on to boil. “OK now, take a whiff of my mixture and see if you recognize it,” and I held the bag open just under her nose. I just wanted to hug her. I’d only known the woman a few minutes and yet I wanted to keep her forever. “Not today, Neldy, I’ll just put it on your tab,” and we laughed again as I measured a quarter cup of my herbal mix into a quart canning jar, poured in the boiling water, and set it on the table to watch it turn dark green. “That’s the one. You just have to remember to wear gloves when you harvest it. Nettles make delicious greens, cooked like spinach, collards or mustard greens, as well as dried and stored for making tea. Here, have a taste,” and I poured the steaming dark-green tea through a tiny little strainer into a pottery mug and pushed it over to her side of the table, then fixed another one for me. Neldy wasn’t the first person to be pleasantly surprised at its deep, smooth, mildly minty warmth. Nat would like that. Nat would like her. “Would you tell me one story now?” I asked while leaning my back against the wall, stretching my legs across the bench, tipping my head back and closing my eyes to the world. "Shore 'nuff, but it'll hafta be a short one for now. How 'bout the story of my Airstream over yonder? That'ud be a good start. Well, one day when I was 79 yrs old and livin' in the elder home in Sherman a guy in the room next to me decided to die. Yep, he just decided he was done here and so he gave all his stuff away and I was standin' there when he remembered the Airstream trailer that was sittin' at his daughter's place in Van Alstyne. He loved that trailer. Had mem'ries trav'lin all over the country with his wife b'fore she died. He looked up at me and said, "Neldy, would you take my Airstream and love it?" I said, "Why, sure I will, Haslett, I'll love it real good and proper." And so I do." "Let me see if I've got this straight, Old Man Jackson promised to take a look at the pickup just to get an invitation to come over and maybe get a closer look at you?" Before I could muster up a reply we heard Nat and Buddy pull in and start to unload auto parts. I wonder what Nat brought home for supper? 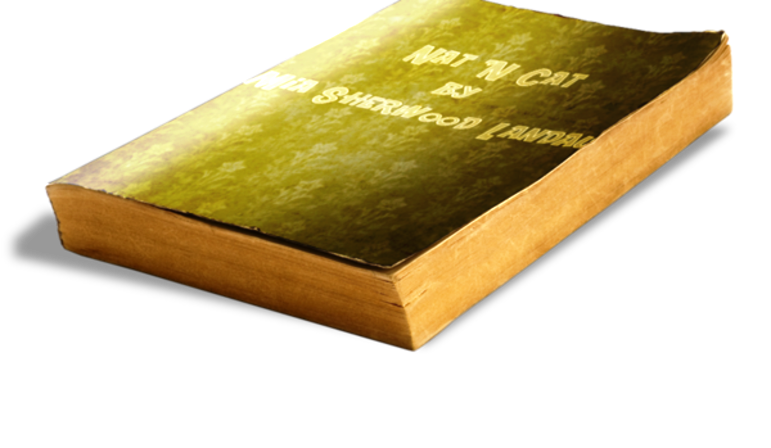 Want to read more of Nat 'N Cat? to find out what Nat brought home for supper and get more Nat 'N Cat now! Story copyright 2010 - 2012 by Mia Sherwood Landau. Simple theme. Theme images by Ailime. Powered by Blogger.